A new piece of kit is being rolled out that will give firefighters a more complete picture of incidents. Hampshire Fire and Rescue Service (HFRS) is the first in the country to be handing out body worn cameras to its officers. The 70 Reveal devices will enable users to evaluate and reflect on their own performance and decisions to see if improvements can be made. On large or sensitive incidents the footage can be reviewed by peers and other managers, providing an enhanced level of tactical advice and debrief. However, the video could also be used to record evidence for fire service and police investigations, and have training applications. It may be a media resource too, giving the public a new insight into the various roles of the modern firefighter. Operational Technology Manager Alex Rhodes said: “It is about seeing more and understanding more. Everyone in the service strives to be better. If a picture paints 1,000 words, a video shows 1,000 pictures. “New body worn cameras are going to help every firefighter be the best they can be and embrace the fact we are, as all fire services are, a learning organisation. A pilot was carried out with nine cameras and the digital evidence management software (DEMS) system in October last year, before the current roll-out to middle-level and senior officers. The footage collected during that period has provided video evidence of a suspected arsonist and been used in an investigation into a boat fire. There have been numerous other occasions when officers have realised that such a recording would have been useful. 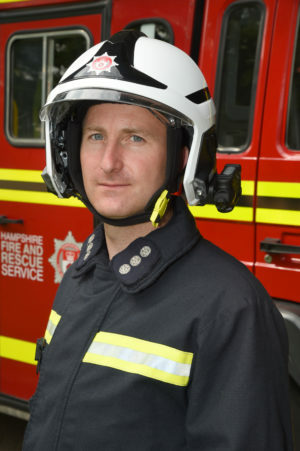 “The introduction of helmet-mounted cameras for HFRS incident commanders is a really positive innovation for us. “We will use them for reflective learning, training, incident analysis and fire investigation. There are many applications. “Having these cameras will demonstrably improve the way we collate situational awareness, carry out incident assessments and make command decisions. 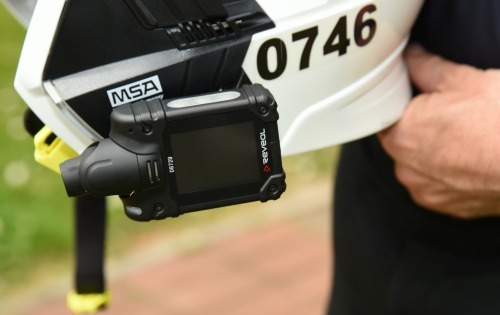 HFRS decided to use the Reveal cameras – to be worn on helmets – and DEMS after discussions with Hampshire Constabulary, which has been using the system for some years. The information is encrypted to ensure security and that, if lost or stolen, footage cannot be viewed by unauthorised people. Footage will be held for a minimum of 30 days. Anything that could be used for training purposes can be kept for a year, while footage that helps evaluate equipment or techniques will be held for two years. If the video has evidential value it may remain on the system for seven years, and footage pertaining to health implications will be kept for 50 years. The lightweight, compact piece of kit will be showcased by HFRS at the Emergency Services show in Birmingham in September.